My favourite route has to be Downfield. I travelled for many years to work and for pleasure on the Downfield tram. When we came back to Dundee, Downfield was almost a village before it extended as it is to-day. Monday morning many of us would get on the tram at School Road and for seating for us all, it would be the semi-circular seat at the back upstairs. There was much hilarity as the Saturday night at the Palais was recalled. The Conductors knew you and took an interest in the current boyfriends. You were greeted by most people who you met regularly. 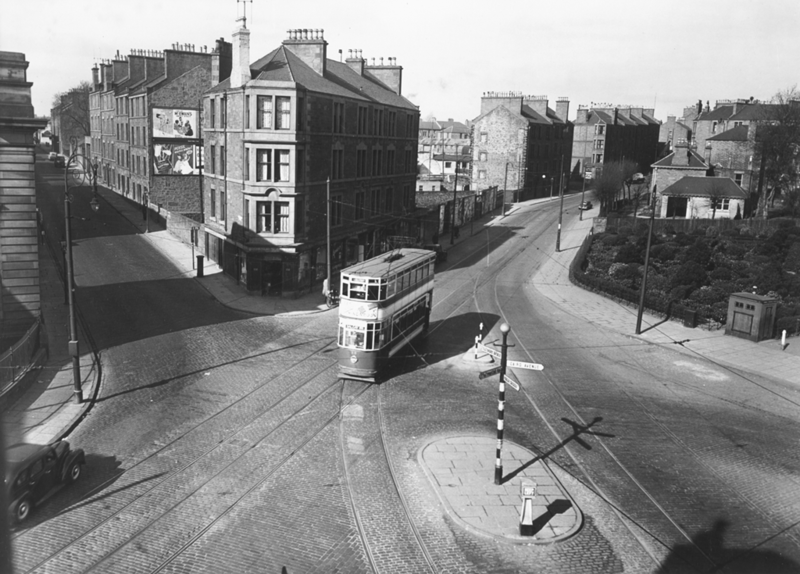 There was a small roundabout at Strathmartine Road and the Kingsway and the tram went right through the middle. There were also tram lines on the Kingsway, just off Strathmartine Road where extra trams sat on Ice Hockey Match nights. The tram to Downfield left the High Street where Primark now is. Before that it was Sim's the Grocer, Lawley's and Kidd's the Baker. The tram terminated near Doc. Stewart's now the Downfield Hotel. These were happy days and I have great memories of all the people I met.